Season chicken thighs and drumsticks with 1/2 teaspoon of the salt and 1/4 teaspoon of the pepper. In 12-inch skillet, heat oil over medium-high heat. Place chicken skin-side down in skillet. Cook 8 to 10 minutes, turning once, until browned on both sides. Transfer chicken to slow cooker. Pour all except 1 tablespoon fat from skillet. Decrease heat to medium; add onions to skillet and cook about 4 minutes, stirring frequently, until softened. Add garlic, paprika, red pepper, remaining 1/2 teaspoon salt and 1/4 teaspoon pepper; continue to cook and stir 1 minute. Transfer to slow cooker. Add chicken broth to skillet. Cook over medium heat 1 minute, scraping up any browned bits on bottom of skillet with wooden spoon. Transfer to slow cooker. Cover; cook on Low heat setting 5 to 6 hours or until juice of chicken is clear when thickest part is cut to bone (at least 165°F). Transfer chicken to serving platter and keep warm. Increase to High heat setting. In small bowl, beat cornstarch and water with whisk until smooth. Beat into cooking liquid in slow cooker. Cover; cook about 15 minutes or until sauce is thickened. Beat sour cream into cooking liquid in slow cooker with whisk. Cover; cook about 5 minutes or until hot. 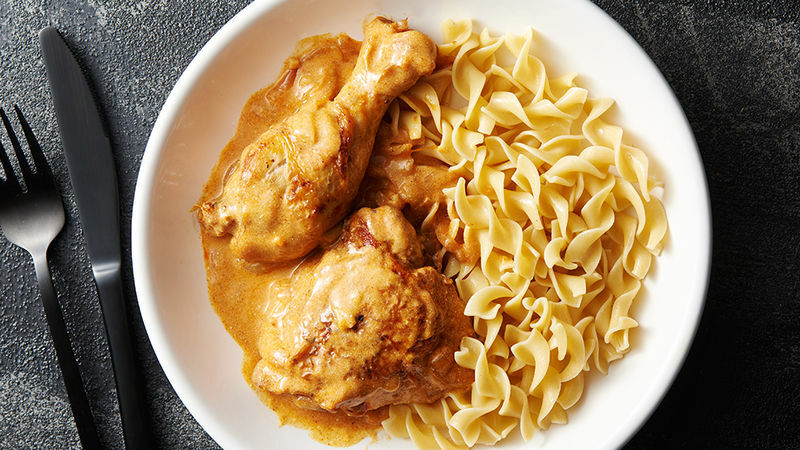 Serve chicken with sauce over buttered noodles. Buttered noodles make a lovely accompaniment to this dish. If you want to explore a more authentic side dish, try spaetzle, a small dumpling that can often be found in a grocery store’s frozen food section. Hungarian paprika comes in two forms, sweet and hot. Sweet is the typical paprika you can find in most pantry shelves. Hot can be purchased at most grocery stores and can be used in place of the cayenne in this recipe, in addition to the sweet paprika.